Semitica 60, édité par Michael Langlois sous la direction de Thomas Römer. Leuven, Peeters, 2018. 555 p.
Jean-Marie Durand & Grégory Chambon. Le creusement d’un puits à l’époque amorrite. Koowon Kim. List of filial duties: its narratological role in the ʾAqhatu story. Israel Finkelstein, Thomas Römer, Christophe Nicolle, Zachary C. Dunseth, Assaf Kleiman, Juliette Mas & Naomi Pora. Excavations at Kiriath-jearim near Jerusalem, 2017: preliminary report. Assaf Kleiman. Comments on the Archaeology and History of Tell el-Farʿah North (Biblical Tirzah) in the Iron IIA. Gaby Abousamra. Huit stèles funéraires phéniciennes inédites. Edgar Kellenberger. Once Again: the Fable of Jotham (Judg 9) and Aesop. Isabel Cranz. The Rhetoric of Prohibitions: Divination and Magic in Deuteronomy and Leviticus. Innocent Himbaza. Le Pentateuque a-t-il été compilé et édité en hâte ?. Nadav Naʾaman. Echoes of the Israelite Conquest and Settlement of the Mishor in the Book of Numbers. Benedikt Hensel. Cult Centralization in the Persian Period: Biblical and Historical Perspectives. Zoltán Niederreiter & Benjamin Sass. On a cylinder seal with a newly deciphered Arabian legend. André Lemaire & Michael C.A. Macdonald. Some ancient north Arabian notes. Matthew Phillip Monger. 4Q216 – A New Material Analysis. Clément Moussé. Les sanctuaires des prophètes chez les pèlerins chrétiens et musulmans, le sanctuaire d’Hébron ou le Ḥaram al-Ḫalīl. 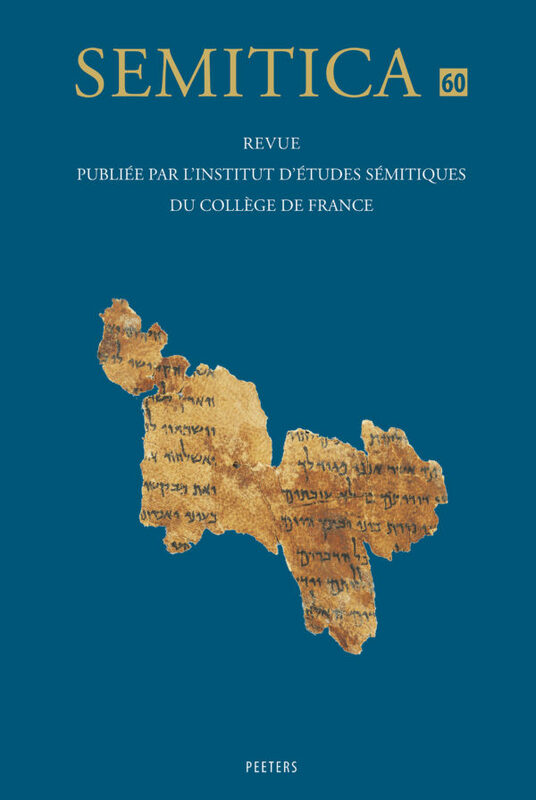 Papers delivered at the workshop “The Assyria–Levant Experience: Postcolonial Perspectives” held in Paris on 24–25 February 2017. Ido Koch. Introductory framework for Assyrian-Levantine colonial encounters. Christian Frevel. Was Aram an Empire? A kind of a shibboleth-question. Ido Koch & Lidar Sapir-Hen. Beersheba–Arad Valley during the Assyrian Period. Lionel Marti. The Levant and Assyria: perspectives from Assyrian royal inscriptions. Yifat Thareani. Revenge of the conquered: paths of resistance in the Assyrian city of Dan. Virginia R. Herrmann. Cosmopolitan Politics in the Neo-Assyrian Empire: Local Elite Identity at Zincirli-Samʾal. Jakob Wöhrle. “Woe to the Bloody City” (Nah 3:1) Postcolonial Perspectives on the Image of Assyria in the Book of Nahum and its Early Reception History. Ces leçons auront lieu au Collège de France (11, place Marcelin Berthelot, Paris 5e) les lundis 9, 16, 23 et 30 octobre 2017, à 14h30, amphithéâtre Guillaume Budé.